A small area of modern Pembrokeshire, comprising a narrow strip of enclosed land and ‘cottages’ lying between Mynydd Carningli and Newport town. It lies within the medieval Cantref Cemaes. Cemaes was brought under Anglo-Norman control in c.1100 by the Fitzmartins who retained it, as the Barony of Cemaes, until 1326, when they were succeeded by the Audleys. The Barony was coterminous with the later Hundred of Cemais, which was created in 1536, but many feudal rights and obligations persisted, some until as late as 1922. The area lies along the northern edge of the unenclosed moorland of Mynydd Carningli and it is likely that it too was unenclosed during the medieval period, forming part of an common (see Carningli character area). 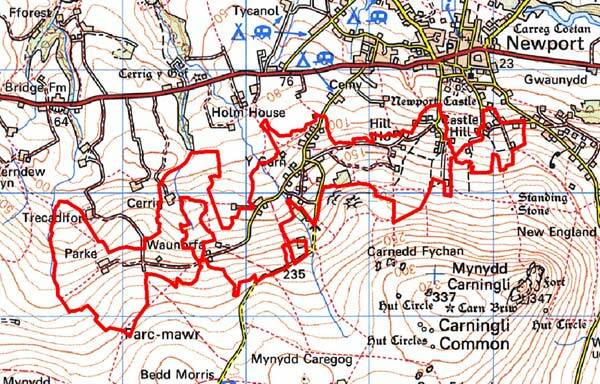 There is no immediate evidence for early enclosures in Y Garn Parke character area but prehistoric field systems have been recorded on Mynydd Carningli. 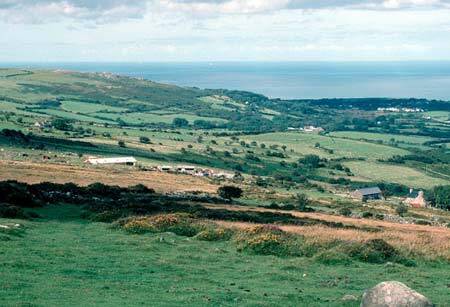 The common was held directly by the Lords of Cemaes, but in 1278 Nicholas Fitzmartin issued a charter, specifying the borough boundaries and granting the burgesses right of common grazing over ‘all my land wet and dry, moors and turbaries’ on Mynydd Carningli. This area is crossed by the medieval Newport-Haverfordwest highway, ‘Ffordd Bedd Morris’, and the holding of Parc-y-marriage, which lies partly within this area, was recorded as demesne in Nicholas Fitzmartin’s charter. The medieval pilgrimage chapel of Capel Curig also appears to have occupied the area, but at an unknown location. Such chapels rarely appear to have been accompanied by any form of settlement. Most of this area in fact appears to have lain within the unenclosed common land, which, during the medieval period, probably extended as far as Newport town and the castle; surveys of 1434 and 1594 suggest that the southern limit of the town was much as it is today. Indeed the form of the present enclosure suggests that it largely represents post-medieval encroachment onto the common. A painting by J ‘Warwick’ Smith, from 1787, appears to show open land descending to the castle, suggesting that some of this enclosure is very late indeed, but it may be artistic convention. A close examination of the enclosure reveals two distinct patterns. One comprises small, irregular fields from informal enclosure, possibly resulting from ‘squatter’ settlement, characteristic of the 18th century and first half of the 19th century when squatters settled on the fringes of common land at a period of rising population. The second comprises regular, rectangular fields that appear co-ordinated, and are possibly later. 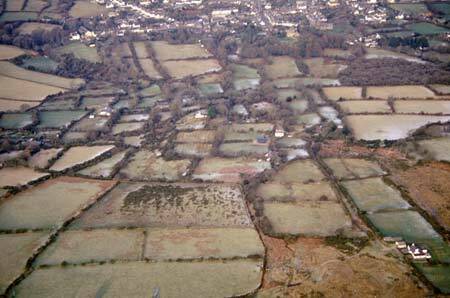 The field pattern extends into the parish of Dinas. There is very little cartographic evidence to indicate the form and density of settlement in the 18th century and early 19th century apart from a couple of mid 18th century estate maps. These are useful as they show small fields and farms over at least part of this area interspersed with pockets of common, showing that colonisation of the landscape was in progress. Right of common pasture appears to have ended by the early 19th century and the tithe map of c. 1840 shows a pattern much as today, although there has been some loss of settlement, particularly at higher levels. This historic landscape character area occupies a 300m to 600m wide band on north-facing slopes at 100m to 200m high sandwiched between the lower-lying Newport coastal plain to the north and the higher unenclosed moorland of Mynydd Carningli to the south. It is characterised by a fairly densely packed distribution of cottages and small agricultural holdings set in a landscape of small, irregular fields. Pasture is the dominant land-use, but much of the land close to the mountain edge is reverting to rough grazing and moorland, and scrubby woodland is regenerating in sheltered hollows at lower levels. There is very little improved pasture. Boundaries to the small fields are a mixture of stone-faced banks, stony banks and dry-stone walls; with dry-stone walls probably the dominant type. There are gaps in some of the banks, and many of the walls are in poor condition. Barbed wire fences supplement these older boundaries in many instances. At higher levels it is a virtually treeless landscape, but at lower levels overgrown hedges, many containing much gorse, and scrubby woodland lend a wooded aspect to the landscape -an aspect that is emphasised by occasional small coniferous shelter belts. Dwellings are generally of two storeys (with one storey, and one-and-a-half storeys present) and three bays. They are in the broad vernacular tradition of southwest Wales, some with polite ‘Georgian’ pretensions. Their box-sash windows, symmetry of layout and occasional architectural detailing indicates a mid to late 19th century date for the construction of most of them. Generally the house quality is better in this area than in other fringe agricultural settlements, indicating perhaps an income from sources other than agriculture. Very small ranges of stone-built agricultural buildings, some attached to the ends of dwellings and some detached, testify to the original function of these settlements. Many of these outbuildings have been converted to non-agricultural use. Most dwellings are not now agricultural, and only a few examples of modern, small, concrete, steel and timber outbuildings have been constructed. Local stone, dolerite, is the chief, traditional building material, although in many instances this is assumed as it is covered in cement render. Slate is the only roofing building material noted, and all was the commercial machine-cut variety. No local slate was recorded. There are a few modern dwellings in this area. A network of lanes, trackways and paths, often flanked by high banks, connects the settlements. The few recorded archaeological sites in this area include a fold/pound, a possible round barrow and other possible prehistoric sites. Several deserted settlements/dwellings testify to the depopulation of this area in the late 19th century through to the mid 20th century. This is a distinct area, although it is not easy to define its boundaries with precision. Along the northern edge this area merges with larger farms and larger fields, and to the south, west and east reversion of pasture to rougher grazing and moor is leading to a blurring of the boundary between this area and open moorland.